Wellington Mk.X's of No. 37 Squadron on the airfield at Tortorella, Italy. In 1944 No. 37 Squadron flew the Vickers-Armstrong Wellington Mk.X bomber (affectionately known as the "Wimpy" by RAF aircrews) and was part of 231 Wing, 205 Group, RAF. 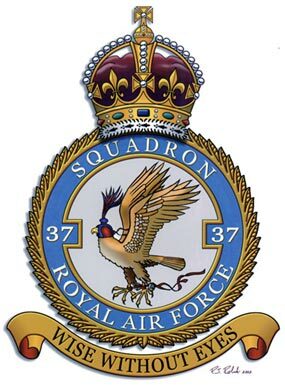 The group was under the operational command of the 15th United States Army Air Force from its inception and was the only RAF bomber force to ever operate under foreign command. The 15th Air Force was the major component of the Mediterranean Allied Strategic Air Force (MASAF) which in turn was part of the Mediterranean Allied Air Forces (MAAF). 1. To destroy the Luftwaffe. 2. To participate in the Combined Bomber Offensive (CBO) with the 8th Air Force (based in England), which called for the destruction of the aircraft industry, ball-bearing factories, oil, rubber and munitions factories and naval bases. 3. To support land operations in Italy, mainly by deep interdiction. 4. To weaken the enemy effort in south-eastern Europe and the Balkans in support of Soviet land operations. The story of the daylight operations of the 15th USAAF is fairly well known and extensively covered by American authors (Ploesti by Dugan and Stewart, Target Ploiesti by Newby, Those Who Fall by Muirhead, The War of the Cottontails by Cubbins, Into the Guns of Ploiesti by Newby, and Wild Blue by Ambrose, are all excellent reading on this topic), however, the role of the RAF night operations over the same targets was, and is, largely ignored or forgotten. RAF veterans commonly refer to air operations in Italy as ""the forgotten war". It's a term that was as true during WWII as it is now. The reasons for this are many, but the fact of it is especially tragic considering the incredible job the RAF aircrew did under the most unusual, and terrible, of conditions.